Kongguksu is an interesting bowl of noodle soup. It is icy cold great for the warm weather. It has an unsual cold soy milk broth with added nuts for more flavour. 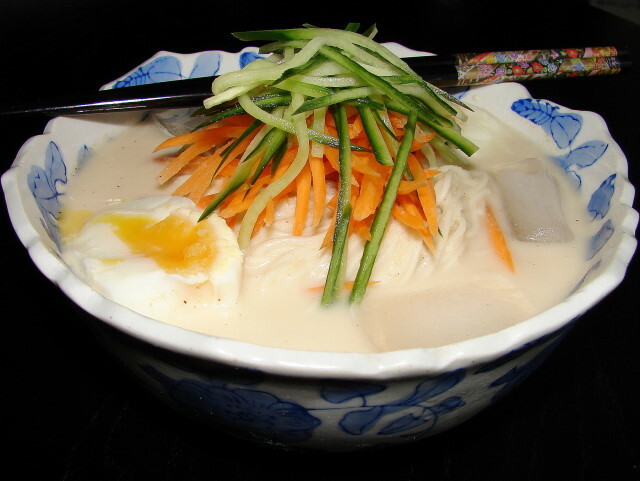 The broth is mild, nutty, delicious and healthy. If you like strong flavoured noodle soup this recipe is not for you. This soy milk broth is not the normal soy milk. Soaked soy beans are boiled then blended with water to a creamy thick milk, seasoned and strained without further cooking. The recipe is quite easy, essential tool is a liquidiser. Soak beans overnight or 8 - 10 hrs. Rinse and boil with water. After the water is boiling rapidly, turn the heat down and simmer for about 12 - 15 minutes. Rinse the boiled beans with cold water. Rub beans to remove skins. Add enough water the skins will float on top, remove skins with water. Repeat with more water till all the skins are removed. Put beans, peanuts and sesame seeds in liquidiser. Add about 750ml cold water, some salt. ground pepper and few ice cubes. Blend for about 1 minute. Strain milk with fine sieve. Boil noodles per instruction. Rinse with cold water and drain. Pour in enough soy milk. Add cucumber, carrot, boiled eggs and ice cubes. My boiled eggs were a little underdone with running centre. Not a pretty picture but tasty . Suitable for vegetarian, just leave out boiled egg. Nice eaten with some kimchi or other vegetable pickles.